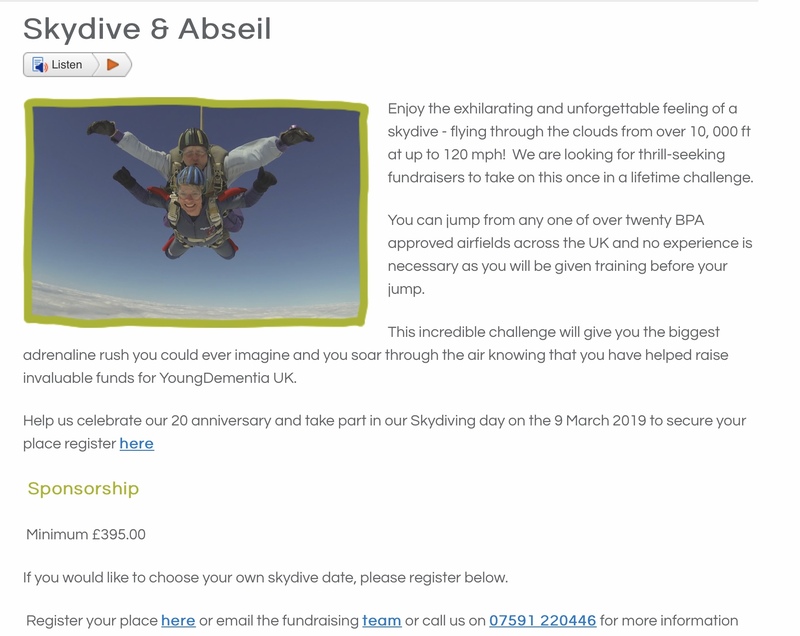 And for my next challenge……..A SKYDIVE!!!! | Which me am I today? And for my next challenge……..A SKYDIVE!!!! Last year….well I think it was last year – ha!, I raised money for my local hospice, Dove House, where my daughter is a nurse. For them I walked on fire😳…..it was amazing….. So what next I asked myself…..and then an advert popped up for Young Dementia UK! It’s there 20th Anniversary this year and they decided to celebrate their epic journey supporting people with Young Onset, on the 9th March…. I did wonder if the skydive people would decline me due to having dementia but they simply gave me a form for my Gp to complete…..
Once I got the confirmation of the venue and time of arrival, I sheepishly told Sarah, Gemma and Stuart as I have to rely on them getting me there……well it’s at Bridlington air field (did I really just type ‘airfield’😂) on March 9th, but wait for it……..arival time……07.30am🥴…..I apologised to them before I told them the time😂🤣. I need 500 lovely people to donate £1. Or you may feel able to ask colleagues at work, friends in a book group, or anther group of friends, if they too would also donate £1 and add it as a whole to my fundraising page, telling me it’s from you and your friends and where you’re from? I know we’re in strange financial times at the moment but any donation, no matter how small would help me raise the money I need, to make a difference to the work being done by Young Dementia UK for people affected by dementia. You can donate on the link below. You are amazing!!! We,ll donate £10.You’re very brave. You really rock, Wendy! Skydiving! What next? Spelunking? Our bodies remember how to ride a bicycle. Our fingers know which letters are assigned to them when typing. Our bodies then may remember what it is like to take that great leap out of a plane and land. My body remembers what it was like to spelunk in a Vermont cave many years ago. I felt confined when facing a small keyhole and decided I must leave. Two other spelunkers and I returned to the cave opening together. They returned. I looked at the beautiful autumn leaves and felt reborn. So glad its not bungee jumping, potentially not good for raging eyes. I was in awe when you went on the big dipper….but this!!!!!! Have posted the message to my Facebook paqe and happy to put in a bit towards your fundraising. Well done Wendy.